Recently Grand Velas Riviera Maya was honored with the 5 Diamond award by AAA, in recognition of excellence, quality, hygiene, environment, amenities and service offered to guests. Every year, more than 60 travel editors from this prestigious organization evaluate without previous notice thousands of tourist lodging options throughout the United States, Canada, Mexico and the Caribbean. The 5 Diamond rating is awarded to only 0.27% of the 60,000 properties assessed. This award affirms Grand Velas Riviera Maya’s position as one of the best resorts in Mexico and the entire continent, with its dazzling facilities and luxury suites, exquisite restaurants with internationally acclaimed chefs and a spectacular world class spa (winner of Virtuoso’s Best Spa in the World award). 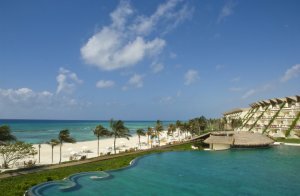 Velas Resorts has now been awarded 26 Diamonds by AAA among its four properties in Mexico: Velas Vallarta, Casa Velas, Grand Velas Rivera Nayarit and Grand Velas Riviera Maya, placing them among the most sophisticated traveler’s preferences and acknowledging the group’s commitment to only offer the very best.